We are very excited to have our new workbench in nursery! We have been using real tools on our workbench and making some great models. First we learnt how to keep ourselves safe. 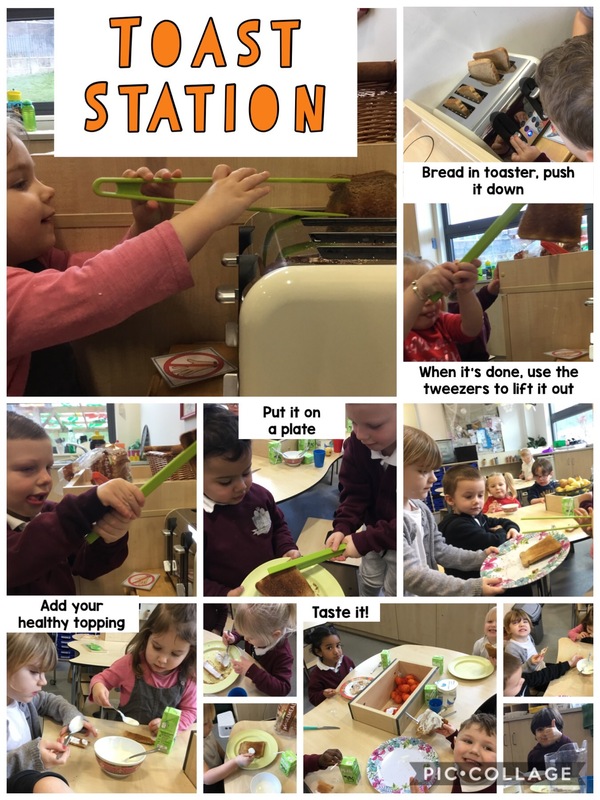 We explored the tools and learnt about the best ways to use them. We thought about how to keep ourselves safe and put hand prints on the bench so we knew how to keep our hands a safe distance away. We wore safety goggles to make sure we didn’t get anything in our eyes. There are rules we have to follow when we use the work bench and we have all been very good at listening to the rules and keeping ourselves safe. We started off by exploring each tool one at a time and finding the safest and most comfortable way to use them. Once we were confident we started to combine tools by cutting wood and screwing two pieces together. Now we are more confident we are starting to plan out what we want to build by drawing pictures and making our models. 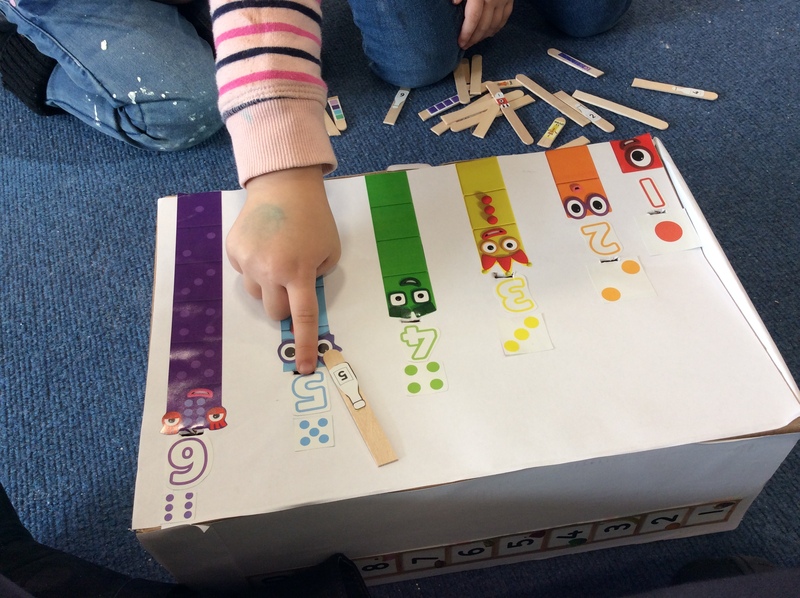 This week we have made robots and cars. We have even started to try and make our models even better by going back and adjusting the wheels to try and make our cars work. Using the tools is a great way to build children’s fine motor skills which helps to get them ready for writing. To use the saw and hammer the children need strength and coordination. To use the screw driver they must work with control, slowly and carefully. Whenever we use the tools the children have to listen very carefully and follow the instructions to work safely. They have to think of their own safety and the safety of their friends around them and concentrate very hard. When they make models they need to try different ways of doing things and make adjustments to make it work. Already the children are becoming more safe and confident with using the tools and we have been very impressed with what they have made. Buttons and zips help children with coordination and strength in their fingers. Encouraging children to help to get themselves ready for school by putting on their own shoes and socks or trying to get themselves dressed this will all build up children’s strength in their hands and arms. Children need to build up their big muscles in their arms and shoulders as well as the little ones in their hands and fingers so lots of climbing at the park or riding bikes helps to build these muscles. Toys and activities like using blocks, Duplo and Lego all help with children’s fine motor skills. As they get more confident with the bigger blocks getting out smaller ones like Lego will help to strengthen the muscles in their fingers. Threading, sewing, play dough and using scissors are all great ways to strengthen finger muscles. Lots of chance to make marks like with a tray of gel or shaving foam that children can make marks in with their fingers or big chalks on the ground outside. Using big paper helps to build up bigger muscles. Painting, colouring and drawing are all great ways to get ready for writing. 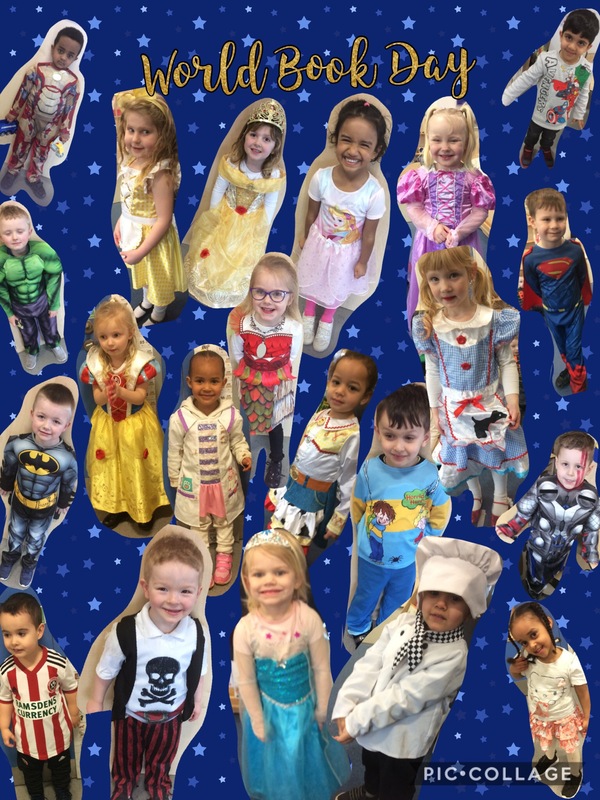 In nursery we love to make up our own stories. Sometimes we use objects to help us think of a story, sometimes we change a story we already know or sometimes we use pictures to help us. Last week we looked at funny photos of animals and made up stories about what we could see happening. Once upon a time there was a zebra called Stripey and he had to go to his work. His work was a job in town. He was too tired, he asked his friend Giraffe to give him a piggy back. Giraffe took him to his job and he got there very fast with his big legs and he wasn’t late. Oh no! Giraffe couldn’t fit in the door. Stripey said “I know!” and Giraffe put his neck down so Stripey could fit through the door. He went to his job. The End. Once upon a time there was a frog called Tiny Tim. He wants to go to the seaside so he jumps on Gary the Snail. “Ribbit”. He says “Go Gary Go!” But Gary the snail is a snail and he goes very slowlyyyy. “Oh no!” said Tiny Tim. He jumped off Gary the Snail. “Ribbit”. Then he jumped onto a horse coz horses are fast. The horse went fast fast fast to the seaside and Tiny Tim built a sandcastle. Gary the Snail was very slow he got to the seaside and it was dark and it was bedtime. They went to sleep. The End. Why not make up your own story? You could change one of your favourite stories, you could put yourself into a story that you like, You could look at pictures and tell stories about what is happening, you could dress up and act out stories or you could use your toys to tell your own stories. Story Telling is a great way to help children’s speaking and listening skills. It helps them to be imaginative and listen to other’s ideas. It helps them to understand stories ready for when they start to read stories themselves. 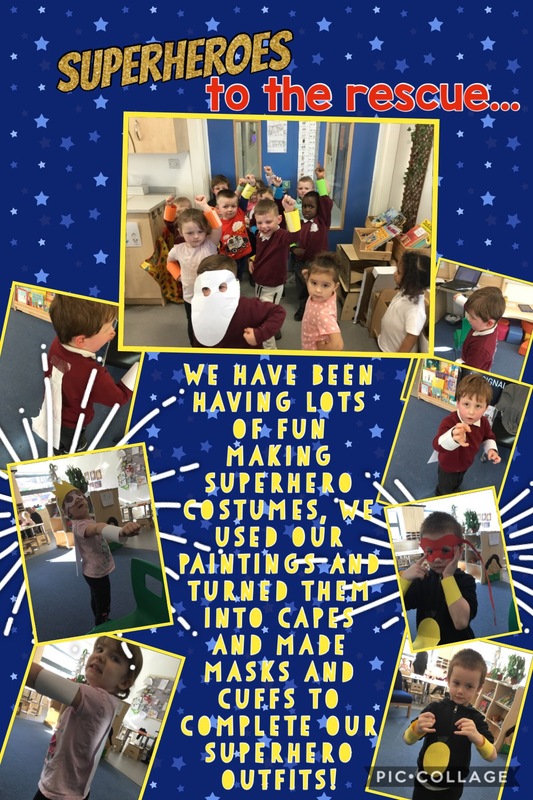 Today we had a very exciting day in nursery, the owls came to visit! First we had a talk about owls and learnt what the different owls eat, where they live, why their talons are sharp and how they hunt for food. While we listened the owls flew around the room, sometimes just over our heads! Next some children had the chance to stand up and wear a special glove and the owls flew to them! At the end we sketched the owls. Lacey said it was the best day ever! We have been looking at artists this week in our mark making area. We used pieces of coloured card to make collages in the style of Henri Matisse. We coloured blocks in the style of Piet Mondrian using blue, red and yellow felt tips. We drew abstract pictures and coloured them in the style of Wassily Kandinsky. We share our artwork with our friends and talk about ways we can make it better. This year in nursery we have started writing journals. We have been practicing our mark making, drawing and writing. Have a look at some of the activities we’ve been doing. First the children had four circles on their page and could choose to draw whatever they wanted, we thought about how to hold our pencil. When we read the story of ‘Brown Bear, Brown Bear, Who do you See?’ the children copied their names and coloured their friend. We thought about drawing faces and choosing colours. Sometimes we tell stories, the children had an outline of a bear to colour and add details to, like grass or a cave. 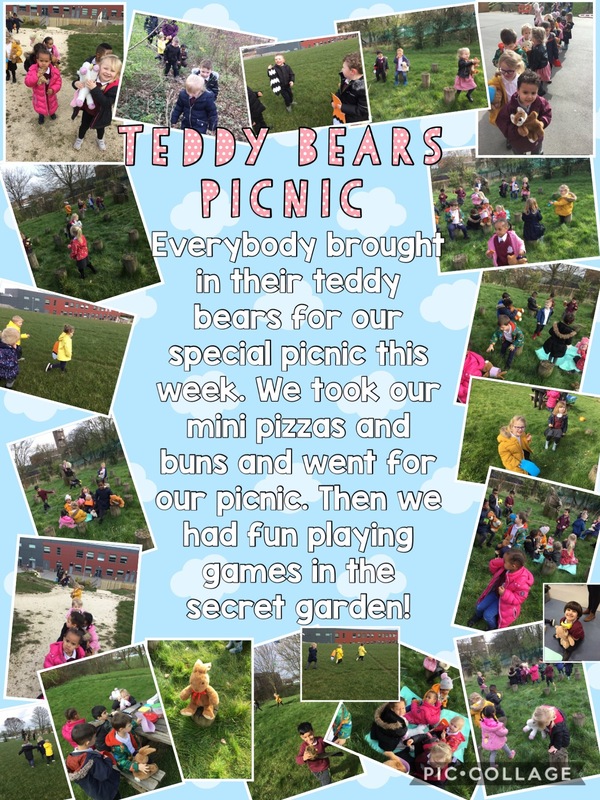 The children then told a story about bears, either retelling parts of stories they knew or thinking of their own. After making potions the children drew and wrote ingredients for their own potions. They talked about why they needed them in the potion and what the potion would do. We thought about the difference between drawing and writing. We also have lots of chances to practice our names, do you practice your writing at home?